I have just ordered some 8ft canes. THIS SUPERB VARIETY OF VICTORIAN TALL PEA HOLDS THE GUINNESS WORLD RECORD FOR THE TALLEST PEA IN THE WORLD, WITH THE RECORD HOLDING PLANT MEASURING IN AT OVER 14 FEET TALL !!! Search by nearest to you for cheapest delivery. Several people on my allotment swear by these mattocks. They’re easy to use – get the job done and aren’t as much hard work as a spade! I find ebay really useful for buying plants and seeds. Mahonia aquifolium at Ebay. I’ve just ordered a plant – it’s great for bees, the berries are enjoyed by the birds and can be used for jam or wine too. It grows about a metre tall and spreads to about 1.5m. I’m going to put it in my front garden. It’s tolerant of poor soil and will manage in a drought. Not sure that’s going to be an issue in the UK though! It shouldn’t create too much leaf litter and flowers in winter so providing colour in the garden. Did you know you can buy plants on EBay UK? You can ebay uk garden plants and get some bargains! Buy it. plant it, use it. Buy seeds or root cuttings. 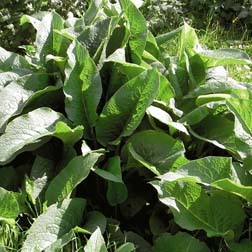 COMFREY – SYMPHYTUM OFFICINALE seeds. Thompson & Morgan have seeds and cuttings.